For financiers, the Middle East has turned from a source of oil-rich clients to a major anxiety. That was the view of around 200 guests at the Breakingviews Predictions summit in London on Jan. 14. They voted the region as the main reason for losing sleep this year ahead of China’s economy and collapsing commodity markets. Worries about an “Arab winter” are well founded. Falling oil prices are testing Middle East economies and their regimes – which depend politically on the wealth pumped from below their deserts – to breaking point. Brent crude was below $30 per barrel on Jan. 15, marking an almost 20 percent decline in the first two weeks of the year. Saudi Arabia and its oil-rich Arab allies are tightening their belts and falling back on their sovereign funds. They may have to sell almost $500 billion worth of assets this year to cover budget shortfalls should oil hit $20, according to Breakingviews analysis of their breakeven costs. Liquidating almost a quarter of the $2.3 trillion of sovereign funds amassed by sheikhdoms would hit already struggling markets. It might already be happening. The MSCI International World Price Index – a broad measure of stocks across 23 developed markets – has fallen more than 13 percent over the last six months. These declines, especially in European and Asian markets where Gulf funds are heavily invested, could accelerate should crude prices cause more economic turmoil in the Middle East. Then there is the fraught politics. The year started badly with Saudi Arabia cutting diplomatic ties with its main rival Iran. Both regional powerhouses are already supporting opposing sides in proxy sectarian wars in Syria and Yemen. Along with the rise of Islamic extremism, these conflicts have turned the region into a tinder box and led to a flood of refugees that is feeding tensions in Europe. In such circumstances, it’s almost impossible for either Riyadh, or Tehran, to cooperate on oil policy and prevent crude hitting $20 per barrel. The economic and political storm brewing in the Middle East has sent a wintry chill around the world. This year expect the Arab world to top the agenda. 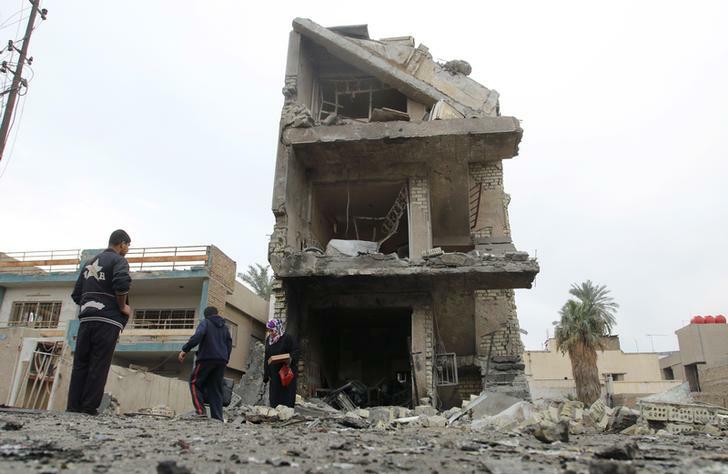 Residents inspect the site of a car bomb blast in New Baghdad, January 12, 2016. Attendees at a Breakingviews Predictions debate in London on Jan. 14 overwhelmingly voted the Middle East as their top concern for 2016, above falling commodity prices, corruption, Russia and the European economy. Brent crude fell below $30 per barrel on Jan. 15 as the selloff in oil markets intensified ahead of the expected lifting of international sanctions on Iran. The collapse in oil prices is weighing heavily on the economies of the Middle East, especially Arab states in the Gulf. Saudi Arabia announced on Dec. 28 a record budget deficit equal to 15 percent of gross domestic product along with spending cuts. The kingdom is also locked in a bitter diplomatic row with rival Iran. The kingdom cut diplomatic ties with Iran after protestors on Jan. 3 stormed the Saudi embassy in Tehran.